Going to the beach with our family and friends is one of the best bonding outdoor experiences. Every time you are on a family trip, or just passing trying to unwind with friends, the beach offers a variety of unforgettable activities, laughs, and memories. However, a beach also exposes you to a dangerous dose of UV rays. Sunscreen is just not the complete solution. It wears off quickly; it is nearly impossible to apply it perfectly, and of course, you want to be in the water eventually which just washes most of the sunscreens off. Having a quality beach tent is always a great way to relax on the beach and to prevent sun damage to your skin. The best way to stay protected against the harmful effects of the Ultraviolet (UV) of the sun in the beach is to stay in a tent. Most tents come with unique fabrics with special coatings which blocks both the Ultraviolet –A (UVA) and Ultraviolet-B (UVB) of the sun. UVA penetrates deeply into the skin to make you sunburned and extended exposure can cause certain types of skin cancer. UVB on the other hand, affects the skin’s outer layers and causes you to be sunburned faster than the UVA rays. Dermatologists often remind lovers of the beach to always stay protected because too much sunburn increases the chance of developing melanoma. Being in the beach without sunblock protection is ridiculous. Not being in a UV shelter is extremely dangerous. To differentiate UPF from SPF (Sun Protection Factor), UPF is the sun protection rating for fabrics while SPF is for skin products. The Ultraviolet Protection Factor (UPF) of a fabric determines how effective it is in blocking out the ultraviolet rays of the sun. These ratings range from between UPF 15 to UPF 50. The higher the rating the more protection it can provide. Should a fabric have a rating more than UPF 50, it is given a UPF 50+ rating. The Pacific breeze beach tent comes with water-resistant PE floor, large windows for ventilation, and provides cover on all but one side. Its lightweight fiberglass frame is easy to setup. The breathable polyester shade material has UPF 50+ protection. 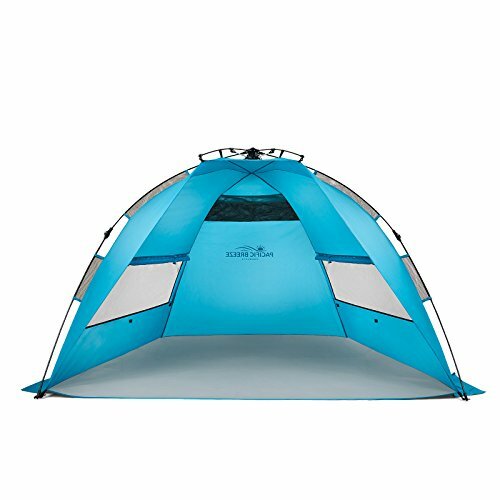 Spacious interior, internal pockets, and other features make it one of the most purchased and reviewed beach tents of our picks with over 2000 customer reviews! Sandbags are also provided which anchor the tent in heavy winds. Clearly, one of the best beach shelters! Ease of Set-up and Take Down – The EasyUp Hub System of this beach tent makes it easy to set up and pack up. It is the claim of Pacific Breeze that this tent’s set-up and take down procedure is unmatched by any tent in the market. This tent unpacks in less than a minute. Lay out the tent and it will pop and assemble on its own. Position the sandbags so tent stays in place even with strong winds. Size – This spacious 87” L x 47” H x 49” D, tent can comfortably fits 2 adults or about 4 kids. When folded, this tent is lightweight and compact enough to take anywhere with ease. Sun Protection – This tent provides a UPF50+ sun protection so you can enjoy the beach without fear of being burned by the sun. It also provides protection against sudden rain as well as other elements. Design and Construction – This tent is made of lightweight synthetic fabric with a light and durable fiberglass frame. Fiberglass is a non-corrosive material thus it will last for years even when exposed to the elements at the beach. It also comes with PE floors that are waterproofed. Stakes and sand pockets come with the tent to keep it in place. Its interior is spacious and has internal pockets to keep your personal stuff safe. This tent is durable enough to withstand light winds, sandstorms and rain. It comes with a carrying case for easy transport. Extra Large Size: The tent is 78.7"L X 47.2"W X 51.2"H, 20% bigger than similar products, providing a spacious interior shelter for a family of 3 to 4. Weight: 2.2 pounds. Innovative Design: Innovative pop-up design - no assembly required. Patented structure pops up and down in seconds. Convenient Features: 2 side mesh windows with flaps for good ventilation. 2 zippered doors for extra air flow or privacy - use it as a changing room. Detachable floor meets various needs - either the adults sitting/lying away from the sand or the children playing sand while kept shielded from the sun/wind. UV Guard Protection & Wind Resistance: Special interior silver-coating fabric around the full coverage to ensure the coverage area of Anti-UV effects. Provided sand pockets, extra long stakes and wind resistance cords work together to secure the tent in place under windy conditions. We send the YouTube video of folding this beach tent back to every customer. This affordable beach tent can fit up to 3 people in its innovative design. One of the best features of this type of tent is that it has a pop-up design which requires no assembly at all. You can be assured that you will not have to go through the painstaking procedure of connecting tent poles. The iCorer beach tent cabana has two windows, removable bottom, and features UV 50+ protection. If you want to spend a longer afternoon at the beach, this is one of the best tents for you. With two zippered doors, you can increase ventilation and use it just as a shade as well. Zip the two doors up, and you have a handy changing room. The iCorer setup is simple, easy, and affordable. Ease Set Up / Take Down – This tent does not require any assembly. Set it free and it will pop up on its own in 1 second. A few twists will fold it back in about 3 seconds. Size – It comes in a good size for 2 adults or an adult with 2 kids including a baby. 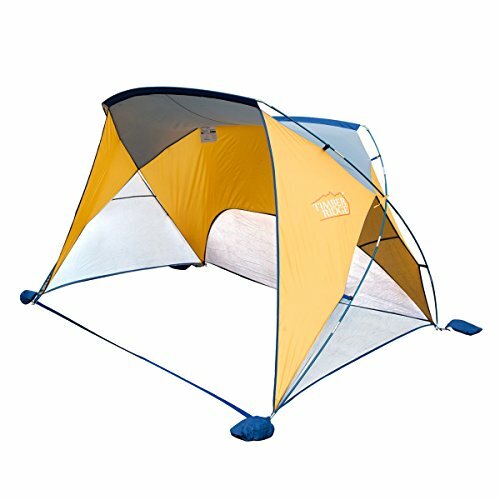 At 6.56’ L x 3.93’ W x 4.26’ H and only 2.2 pounds this tent is extremely portable. Sun Protection – This tent comes in a nylon fabric that is flame resistant and has a 50+ UPF UV rating for sun protection. UV protection is in the silver coating of the entire tent fabric. This is to make sure that UV protection covers the entire tent. Design and Construction – This tent is made of 190T nylon and flame resistant (CPAI-84) fabric. It comes with a wide back window and 2 side interwoven mesh windows for a stylish look and enough ventilation. 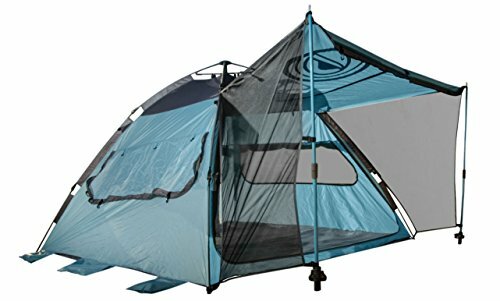 Tent door goes flat and doubles as an extended floor. Tent is lightweight but durable and comes with a sturdy beam frame made of steel. The tent comes 4 wind resistant ropes, 10 long metal stakes and a carry bag. 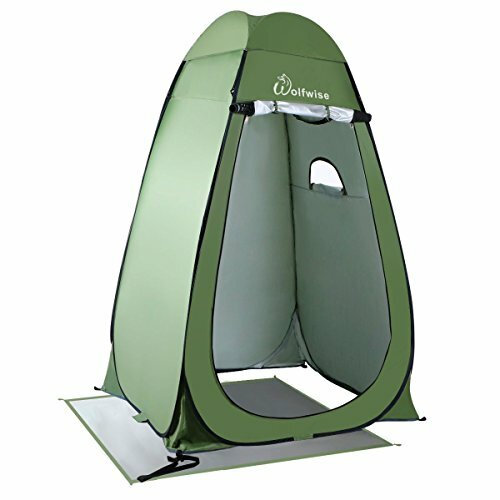 Lightweight quick-set cabana tent with instant set-up technology! Sets up in seconds - all parts contained so there is nothing to loose. The next beach shade tent on our list is the creative outdoors family size cabana setup. With its lightweight and instant setup, you can fit up to 2 adults and two children. If you want to have the perfect family day at the beach, which involves having a picnic in the shade, the creative outdoors cabana beach tent is for you. 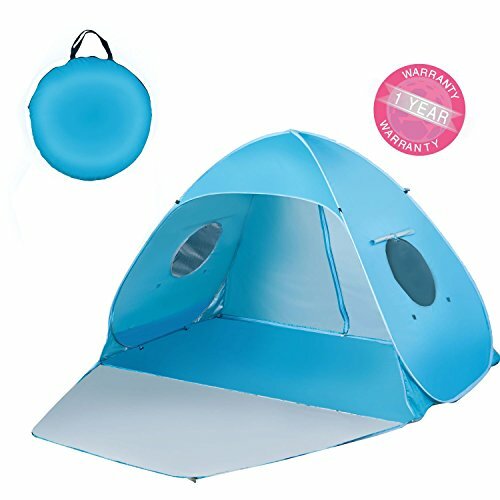 It is mildly priced, comes with a quick pop setup, and has UPF 50+ sun protection for all-day shade. However, the front of the setup cannot be closed completely. This product is primarily focused on providing shade at your long days in the sun but does not offer complete privacy. The exoskeleton support prevents the setup from being blown away by the strong winds or rain at the beach. The product also comes with an extension mat that can be placed at the front for chairs or shoes. Ease in Set-Up and Take Down – The Compression Hub System of this tend allows it to set up in only a few seconds. Take down is also as fast and easy. All parts of the tent are pre-assembled thus there is no danger of losing any part. 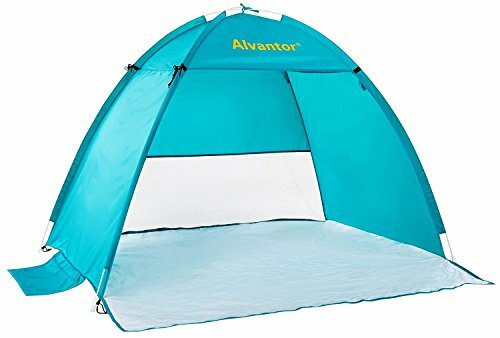 Size – This instant pop up tent and sun shelter is only 7.5 pounds and has a dimension of 93” L x 93” W x 54” H. It can easily fit in 2 adults and 2 kids with still enough room for beach gears and chairs. Sun Protection – Hanging around inside this tent will give you enough protection with its UPF 50+ sun protection fabric. Design and Construction – This tent comes with 3 mesh windows that can be zipped up and rolled down for privacy as well as insect protection and ventilation respectively. The extension shade on top of the tent provides additional shade. This durable designed tent is made of fabric with a polyester blend with fiberglass and plastic poles and frames. It also comes with sand pockets and stakes to make sure tent stays in place even when wind starts to be a strong. EliteTechGear Easy Up Beach Sun Shade Tent/Canopy. Excellent Cabana/Shelter for Kids & Family at the Beach, Sports Events, Concerts, Picnics, Hiking, Camping, & Outdoors.! COMFORT - Get instant relief from the beating sun or pounding rain for you, kids, or anyone with your Sun Shade Tent/Canopy so you can enjoy your outdoor experience at the beach, park, campsite, your back yard and so much more. CONVENIENCE - Great to take with you to sports games, camping, concerts, picnics, hiking, fishing and all your outdoor activities. Portable tent / canopy / shelter is a must have accessory for anywhere under the sun. LIGHTWEIGHT - Only 3.4 lbs. Fast and Easy Set-Up. Bag and stakes included. PERFECT SIZE - Spacious 9 feet (274m) Width, with space enough for 2 chairs. Roll-Up windows. QUALITY & TRUST - Quality construction with a brand you can trust. 100% Satisfaction Guarantee! The EliteTechGear Beach Tent/Canopy is next on our list to provide you and your friend’s sun shade on the beach. Cheap and weighing only 3.4 lbs (1.54 kg), the EliteTechGear setup can provide sun shade up to a whopping 9 feet (2.74m). To increase or decrease ventilation, use the roll up windows and enjoy the shade on your day at the beach. The sun shade provided by this product can fit up to 5 people comfortably. The assembly does require poles for the tent to erect but once figured out; any user can setup within 3-4 minutes. Again, this product is primarily targeted to provide maximum possible shade and may not necessarily serve as a private changing room. However, with the large shade area provided, this product takes its space on our top 15 list. Ease in Set-Up and Take Down – Assembly is quick and easy. Follow the provided instruction guide the first time you assemble the tent and you will no longer need it the second time. Figure out how the 2 poles of the same length and the 3rd pole which is longer are assembled and you will be done in as fast as 2 minutes. Packing it back in the carrying bag is as easy, too. 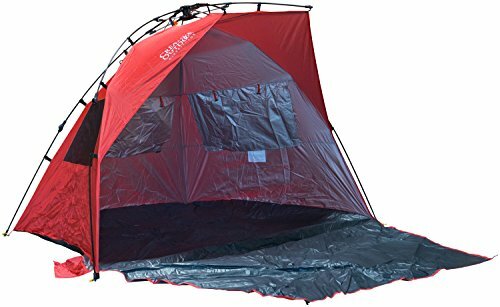 Size – This 3.4 pound 9 feet in width tent can fit 5 people inside. It is spacious enough to accommodate 2 chairs, too. With a folded dimension of 21.5” x 4” x 21.5”, this tent is extremely portable. Design and Construction – This tent comes with windows that roll up for ventilation. It features an interior pocket to hold your valuables. It also comes with stakes and 3 fiberglass poles to keep it secure on the ground. One of the most economical products on this list is the Leesentec Outdoor sun shade. It has a 50+ UPF rating for sun protection and requires no assembly. The sun shade area provided by the Leesentec outdoor setup is 65 x 59 x 43.5 inches (165 x 150 x 110 cm). As one of the smaller items on our list, this product weighs only 2.2 pounds (~ 1 kg) and with practice can be folded down to almost 20 in (~ 51 cm) in diameter. This makes this one of the most portable of our picks. Ventilation is also enhanced by a densely interwoven mesh. Thus is a perfect beach tent for kids. Ease of Set-Up and Take Down – Almost no assembly required. Once this tent is released from its carrying bag, it only takes seconds for it to pop up and be ready for use. Take down is as easy. An instruction guide comes with the set. Size – You can place 2 chairs inside the tent and accommodate 2-3 persons in its dimension of 65” L x 59” W x 43.5 “H. Weighing only 2.2 pound taking along this tent to the beach is no hassle. Sun Protection – This tent comes with a sun protection rating of 50+ UPF so you need not worry about getting exposed to the harmful rays of the sun. Design and Construction – This waterproof beach tent comes in a cool round carrying bag with shoulder straps. The tent is made of tough 190T nylon ensuring long life and for safety. Material is of the CPAI-84 fire resistant type. The fabric features a silver Anti-UV effects coating for sun protection. Tent fabric is also resistant to water. The canopy type tent comes with a mesh window for proper ventilation. Its sturdy steel beam frame, metal ground stakes and side sand bag pockets makes it stable on the ground. 3 person sun shelter with 35 square feet of floor surface, enough to accommodate up to 3 adults. This provides your family, friends and kids plenty of space to relax in some shade while enjoying the outdoors. Automatic patented pop up mechanism allows for quick and easy setup and takedown that can be done in under 30 seconds. This is vital so you can spend less time setting up and more time enjoying your leisure activities. Large mesh windows that provide 360 degree views and maximum breathability. This keeps the summer heat down inside the canopy compared to the temperatures inside other cabanas on the market. Extended ground floor provides additional room for your gear and conveniently folds up to create a privacy room for taking a nap, changing your clothes or hiding the contents of the shelter while you step away. German engineering at its best backed by a 2 Year Guarantee! Every detail was strategically thought out including: an oversized carry bag for ease of storage, internal pockets, external sand pockets for securing tent to ground, and setup directions sewn into the carry bag for convenience. Moving on to a product in a higher price range, we present the Terra Nation RekaKohu Plus setup. This product can provide shade and 98% UV for up to 3 people comfortably. The product features automatic opening and closing system that mitigate assembly or set up time. It also provides complete privacy for changing, or any other use of the front flap is zipped up. Nevertheless, the front flap can be used as a ground mat to provide additional space. The dimensions are 86 x 57 x 49 inches (218 x 144 x124 cm) making it one of our more spacious picks at 7.4 lbs (3.35 kg). This product is not only good for beaches but can also be used for other trips due to its sturdy build. If you are a person who likes to make a long-term investment instead of some poor quality short time products, this is a right choice for all your upcoming travels. Ease of Set-Up and Take Down – Easy and fast set-up and take down is provided by the ESF™ Frame (for more control and stability), and an innovative opening and closing system. Size – This beach tent has a 2.5 square meter floor area, enough to comfortably fit 3 persons. Sun Protection – The tent fabric comes with a UPF 50+ rating equivalent to 98%+ maximum UV protection from the harmful rays of the beach sun. This allows you to enjoy the beach without worrying of sun-damaged skin. Design and Construction – This stylish tent is designed to accommodate 3 persons. It comes with an extended flooring that features an auto open and close system for privacy. The extended flooring also provides more space for additional persons. Sitting under the tent will allow 3600 view of the surroundings. Aside from the open front, the tent has side mesh windows that also provide ventilation. Inside the tent are pockets to store your personal belongings. The tent features external pockets for sand or pebbles to make it more secure on the ground. For extra support and stability, cords and pegs are provided. Fabric for the flooring is made of PU coated Oxford Polyester. The Polyester fabric of the canopy comes with a triple silver coated layers with UPF 50+ sun protection. The tent comes with a zippered carrying bag with shoulder strap. Stainless steel bracket features high strength and firm structure, Large for 5-8 person. Fine light transmittance, ventilation and air permeability, Ultraviolet-proof material makes it workable under harsh sunshine. Great for enjoying wonderful views and outdoor activities such as fishing,picnic,camping even outdoor concert, perfer for using on beach, park, lawn,. If you are looking for just a shade shelter for your frequent trips to the beach and not particularly for a tent, we recommend going for this extremely inexpensive and spacious choice. The assembly includes stainless steel brackets which give the shade strength and can withstand fairly strong winds. The shade material is waterproof and provides UV protection. The downside of this product is the lack of privacy. However, the large shade size can house up to 8 people (5-6 comfortably) making up easily. The dimensions are 90 x 82.6 x 62.99 inches (230 x 210 x 160cm)and the weight is 2.6 lb (1.2kg). This sturdy and durable product are highly popular among young visitors to the beach because of the large area, low price, and relatively easy setup. Ease in Set-Up and Take Down – This beach tent canopy comes with 4 easy to install anchor pins making the tent easy to set-up. Size – This lightweight and super portable tent can fit 5 to up to 8 persons. Its set-up size is 90” x 82.6” x 62.99″. Folded and placed in its carrying bag, it is a compact at 15.75” X 3.5”. Sun Protection – This tent is made of ultraviolet proof fabric to provide the much needed protection against the harsh sun on the beach. Design and Construction – This tent canopy comes in an extremely simple and basic design. It features a back panel and a top shade. It does not include side walls and a front covering making it cool to stay under. The 170T type sturdy polyester fabric the tent is made of has an anti UV coat. The fabric is also waterproof. The tent is reinforced for strength by stainless steel brackets. It folds neatly into a carrying bag. If you are open to paying a higher price for a quality beach shelter, the Terra Nation RoaKohu is one of our favorites. Its sleek and attractive design give it one of the unique looks while simultaneously giving it aerodynamic features for high wind conditions. The dimensions are 71 x 67 x 55 inches (180 x 170 x 140 cm) and it weighs 6 lbs (~ 2.72 kg). The unique design has two poles on the sides that are used to erect the beach shade easily. As before, Terra Nation provides extendable floor/ground area that can be utilized as a mat to lie on the beach for your tan. The RoaKohu also has secure pockets on its inside that can be used to place personal items while your rest. For people that are looking for high-quality beach shade with good UV protection (UPF 50+) but do not like full coverage, the Terra Nation RoaKohu is our recommendation. It has solid construction and stitching making it one of the most durable shades for your trips. Ease in Set-up and Take Down – This fancy and sleek looking beach tent with 2 poles sets up in a jiffy and packs up easily too in its small pouch. Size – With an interior dimension of 71 inches x 67 inches and a height of 55 inches, this beach tent can fit in 2 beach chairs while still leaving enough room for your personal belongings. Kids can stand under the tents. Adults cannot stand, though. It can provide more shade than an umbrella type beach shade. Sun Protection – This beach tent provides maximum UV protection at 98% or a sun protection rating of UPF 50+. Design and Construction – This tent is made of durable materials and an Aerodynamic Design which means it will remain standing and intact even when winds get unruly. It comes with a separate foldable groundsheet for extra area. Inside the tent are pockets for safekeeping of personal stuff. This tent does not come with full side walls and door so you can enjoy the view. CONVENIENT AND COMPACT! Lightweight, easy to carry back pack bag, quick and simple set-up! 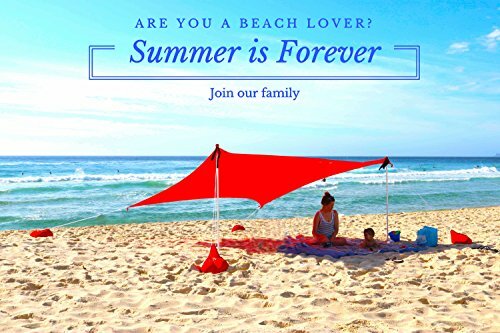 LIGHTWEIGHT AND EASY TO ASSEMBLE - Set up on the beach, while camping, watching sports, or anywhere you may need a sunshade! 100% SATISFACTION GUARANTEED - We are so confident that you will like our Sol ShadeTM that if you return it within 30 days, we will give you a full refund on the product price. Try it, we know you will like it! Another one of our favorite beach shades is the Sol Shade. It boasts 55+ Rated UV Protection and goes up to 8 x 11 feet when stretched. This beach shade is setup using two aluminum collapsible mounting poles. While it gives a large area, the assembly is a bit of a job. To setup this product, you will need to fill up the sandbags as anchors and stretch them as apart as possible to erect the shelter. The mounts are then inserted and can be moved along with the sun’s movement. While the assembly and setup require a bit more than our other picks, the Sol shade is one of the more unique looking beach shelters. It can be carried out in a bag and weighs 4.8 lbs (~2.2 kg). Ease in Set-up and Take Down – This pop up beach shade only needs to be laid out on the sand for an easy set up. Fill the sand bags with weight and stretch them as far away from each other as possible to stretch the fabric to its limit. Insert the leg mounts in the direction opposite to the sun and it is all set up. Pack up is also as easy. Size – Stretched to its limit, this tent has an area of 8’ x 11’. The poles have an assembly height of 65 inches giving the shade enough room for chairs to be positioned between the poles. Sun Protection – The tent fabric has a UPF 55+ sun protection rating allowing you to be safe from the harmful effects of the sun while under the tent. Design and Construction – The shade area can easily be adjusted to avoid direct sunlight by simply pulling out the legs and repositioning it. Even with strong winds, this tent will remain upright as long as you make sure the sand bags are stretched so the fabric is taught. The tent comes with 2 aluminum mounting poles to make set up easy. The tent comes in a carrying bag with straps. Next up on our list is the Timber Ridge Sun Shelter with dimension 108 x72 x 66 inches (274 x 182 x 167 cm) making it one of our bigger picks. The unfolded size goes up to 9 x 6 feet. The Timber Ridge beach shelter is also erected using sandbags as anchors with two lightweight fiberglass shock-corded poles. Guy ropes are used to ensure stability for use on the beach. Even though the product is recommended for just two people, it has space for an extra. The colorful material is durable and provides UV protection through the silver coating on the top. The mesh on the sides and back offers good ventilation as well, making your stay at the beach cool and delightful. This product, however, does not provide a ground mat or flap. This is understandable at the cheaper price range. Ease in Set-Up and Take Down – 2 persons can easily set up this Cabana type tent with the use of a hammer. Take down is much easier. The set comes with an instruction guide for quick reference. Size – The 108 inch length X 72 inch width X 66 inch height dimension of this tent can comfortably fit 2 to 3 persons. For a clearer picture, a queen sized air bed can fit inside with a little bit of space left. It weighs a very light 6.08 pounds. Sun Protection – The fabric at the top of the tent has a unique silver coating for protection against the harmful UV rays. Design and Construction – This tent is made of 190T Polyester fabric. The poles are of fiberglass material. On the side walls of the tent are mesh type windows to provide enough ventilation and to allow you to enjoy the cool sea breeze while inside the tent. Sand bags, guy ropes and stakes as well as the 2 poles keep the tent secured and stable on the beach sand. The tent packs inside a carrying bag. Made out of polyester. Provides shade from the sun, keeps you cool. Water resistant. Folds down easily for portability. No door design. Tent height: 59 inches. Floor dimensions: 9 x 6.5 feet. Pops open in seconds, no assembly required. Simply take out of the bag and open. 4 steel stakes for securing the tent into the ground. Comes with easy to carry bag. Compact and lightweight, won't take up space and easy to carry with two handles. At an inexpensive price, the ALEKO ® PTB21 Outdoor Portable Sun Shelter is one of our compact and lightweight products at 2.8 lbs. (1.27 kg). This beach tent is constructed from polyester and covers the ground area of 9 x 6.5 feet with the height of about 60 inches. Four steel stakes are used to ensure the secure setup of this shelter at your beach. This product makes our list for being inexpensive and large. However, at its price point, it lacks some of the features from the higher range. This includes the lack of door design and poor or no ventilation. However, the product does come with a ground or floor material which can be extended beyond the tent to a total of 9 feet long. This makes it one of the recommended choices at the lower price range. Ease in Set-up and Take Down – This is an instant pop-up tent ideal for the beach that does not need any assembly to use. Once you take it off its carrying bag, it will pop up and be ready for use seconds. 4 steel stakes will keep the tent safely secured to the ground. It can also be easily folded back to the bag. Size – With a floor area of 9 feet by 6.5 feet and a 59 inch height, this beach sun shelter has enough space for a group of 5-6 persons. Design and Construction – This water resistant tent is made of durable Polyester material. It features a floor extension to accommodate more people. It does not come with doors so you can enjoy the view of the beach while being protected from the harmful effects of the sun. It is lightweight at 2.8 lbs and compact enough not to take so much space in your luggage. It comes in a carrying bag with handles. The AlvantorCoolHut Sun Shelter is a design similar to the beach tent by ALEKO with its extended floor mat. This beach shelter is suitable for families and babies with space for up to 3 adults. The polyester walls and the polyethylene floor makes the product fairly durable. The AlvantorCoolhut features ventilation through a mesh window and air flow which is particularly favorable towards young children and toddlers. The Coolhut is comparatively easy to assemble and erect, provides ample space and shade, and all that at a fairly low price. Tent stakes and the PVC poles make the assembly sturdy and durable. Four sandbags ensure secure setup, and three extra are included to be used as anchors. Ease in Set-up and Take Down – This pop up tent does not have any pieces that need to be assembled. Remove the tent from the bag and its opening spring will allow the tent to assemble on its own in about 30 seconds or even less. You can set up this tent alone. It comes with an easy to follow illustrated instruction guide for set up and take down. Size – This cabana type sun shade for the beach is ideal for 2 persons. It has a length of 5 feet, a width of 5 feet and a 4 feet height. When folded and fitted in its circular bag, it has a 23 inch radius. It is light and compact at 2.5 pounds. 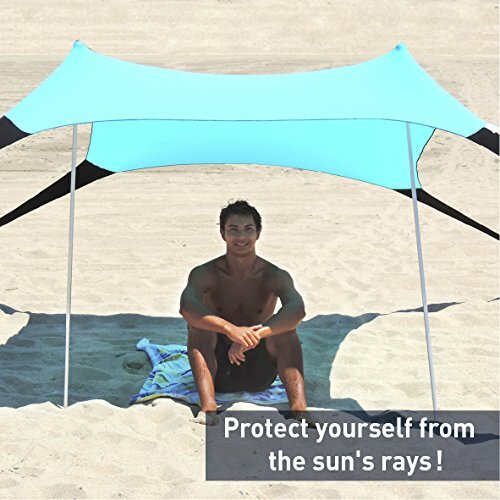 Sun Protection – This tent will keep you and your family and or friends protected from the harmful UV rays of the sun while enjoying the cool breeze of the beach. The fabric of this tent comes with a UPF 50+ sun protection coating. Design and Construction – The walls of this tent are made of 100 % Polyester with a UPF 50 sun protection coat. The Polyester material is easy to clean with just a wet cloth. Its floor is made of Polyethylene material. The tent comes with durable stitching to ensure its long life even when exposed to the elements. It comes with 2 walls, a half back panel and mesh windows for enough airflow. This tent does not have a door so you can enjoy the view of the beach and its cool breeze. It has a small extension foldable mat for additional leg room. The tent is supported by flexible and light PVC poles and sandbags to ensure it stays firm in the ground and upright while in use. LIGHT & EASY TO CARRY - The ZiggyShade weighs between 2 to 2.5kg, and comes with its own carry bag (about the size of a yoga mat) making it easy to take with you wherever you go, even in your suitcase on vacation around the world. The ZiggyShade is available in two sizes: 'STANDARD' - 5.25x6.55ft. (unstretched) 5.5ft Tall. 'FAMILY' - 7.2x7.9ft. (unstretched), 5.5ft Tall. Made from UPF50+ Lycra materials, the ZiggyShade beach tent provides you with a colorful open sunshade for your day outdoors. This large shade shelter also comes with a sandbag and pegs for assembly. The product is lightweight and is available in two sizes. The standard size (2-3 persons) gives a shade of 5.25 x 6.55 feet at un-stretched, while the family size (4-6 persons) goes up to 7.2 x 7.9 feet at un-stretched. The elastic material can be stretched further for more coverage for your family and friends at the beach. With a so many of positive reviews, the ZiggyShade is clearly worth its higher price. Ease in Set-up and Take Down – This beach tent sets up very easily in less than 5 minutes. Simply lay the tent on the ground and fill the sand bags with weight. Pull the sandbags away from each other to stretch the tent. Connect the poles to the tent and pitch them on the sand. Position the poles as from away from each other as you can. You are all done and can now enjoy the beach under the shade. 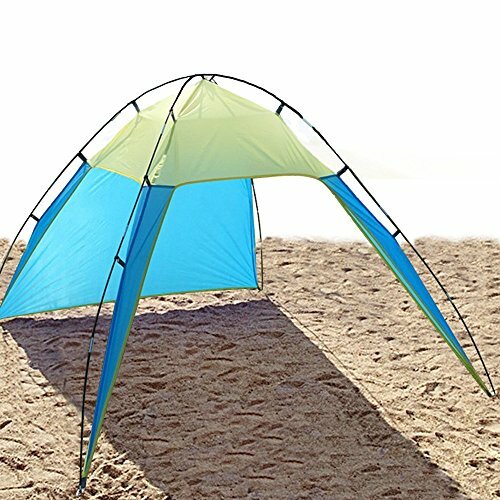 Size – This beach tent is available in un-stretched sizes of 5.25 feet by 6.55 feet and with a height of 5.55 feet for Standard size which is good for about 4 people. It is also available in an un-stretched size 7.2 feet by 7.9 feet with a height of 5.55 feet for its Family size version. This one is good for 6 persons. When folded and inside its carrying case it is about 61 cm in length. It is lightweight at about 5.5 pounds. Sun Protection – The fabric of this tent is coated with UPF 50+ sun protection so you and your family can enjoy the beach without worrying about the possible effects of the harmful rays of the sun. Design and Construction – This tent is made of the durable and elastic Lyca material (the same material swimwear is made of). This fabric is highly resistant to wind and dries up fast when wet. This tent does not have any walls and a door so you can fully enjoy the breezy wind and the wonderful view of the beach while keeping you cool and protected even under the scourging heat of the sun. This is the unique of our picks here and most suited for the lone wolves. With dimensions of 51 x 51 x 76 inches (130 x 130 x 195 cm), this setup serves great as a changing room and shower area at the beach. Two windows meshed screen, and the zippered door gives the maximum privacy. The product does not feature a floor as it also is suitable for showers on the beach. Ease in Set-up and Take Down – This beach changing room is a pop up tent style. Remove it from its carrying case and it will immediately pop up and be ready for use. Taking it down is as easy as folding it and placing it back in its bag. Size – Assembled into a changing room, it is a single person affair being 51 inches by 51 inches by 76 inches. Folded and placed in its circular bag, it has a 23.6 inch diameter and is 1.6 inches thick. Design and Construction – This private shelter that can be a toilet or changing room comes with a roof, 2 mesh windows for proper ventilation and a zippered door for ease in getting in and out of it. A flexible steel frame attached to the 180T Polyester fabric keeps it upright. Our final pick for the best beach tents is the 2 in 1, sun canopy and summer shelter by wild horn outfitters. It is best suited for private families with babies and children and large gatherings. Its versatile design allows you to use it as a canopy or in cabana style or as a camping tent as well. The floor space goes up to 56 sq. Feet with the tent at the height of 4 feet and 8 inches. With the QuickUp automatic frame system, this is the mother of all camping tents, one of the largest beach shelters available, making it our final pick for your day at the beach. Ease in Set-up and Takes Down – Set up could not be as easy with this canopy and sun shelter in one. 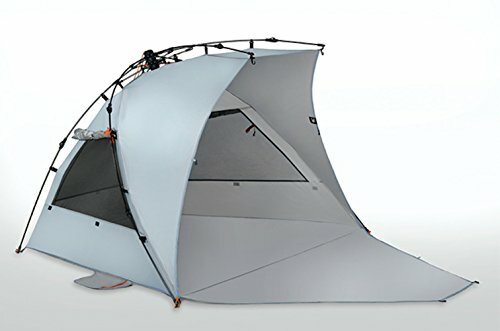 The QuickUp automatic frame system of this tent allows it to be assembled in a few seconds. Take down is a breeze, too. The tent set comes with a set-up and take down video although most customers say there really is no need for one as it is easy to figure out the same. Size – An entire family of 4 can fit into this tent. With a floor area of 56 square feet and a 4 feet 8 inches height, there definitely is room for everyone. You need not bring with you a big and bulky tent to have space for everyone. Sun Protection – Use this as a canopy to provide shelter or as a tent and get 50+ UPF rating for sun protection. Say good-bye to sunburns and the harmful effects of the UV rays and just simply enjoy the cool breeze and relaxing view of the beach. Design and Construction – This is a cabana, canopy and a tent at the same time. This tent comes with 5000mm of waterproofing coating to keep you dry inside despite the rain (light to medium). It is made of 210T Polyester Ripstop. It has floors made of the thick and durable 300D Oxford material. Durable and long lasting zippers open and close the tent door. 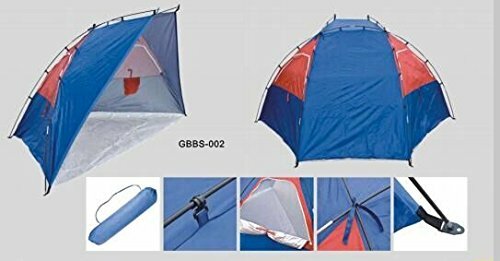 The tent is supported by a tough fiberglass made 9.5 mm frame. With these materials you will surely enjoy this product on many trips to the beach. The sunshade of this tent are adjustable from low to high. If you do not want to adjust the poles of the shade, just keep the door rolled all the way up. 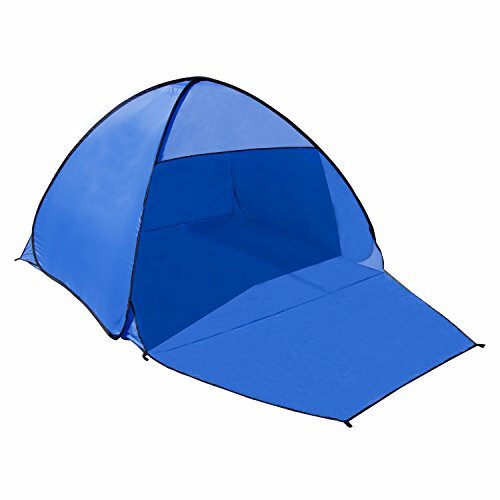 The tent comes with 2 mesh windows for proper ventilation and 2 shades that can be easily detached. Keep the door up and enjoy the cool beach environment while being protected from the sun. Want to spend the night at the beach? Pull down and zipper of the door and get the privacy you need for a relaxing sleep. This tent comes with a carrying bag. When you are out in the beach or the outdoors for that matter, you just simply want to relax, enjoy and have a good time. You would not like to worry about sunburns, getting heat strokes or having a sudden bad weather ruin everything. People who love the beach always pack a beach/ sun shelter. It is the most important gear they never forget to bring. These sun shelters, may they be the cabana or tent types, should be durable, compact, portable and lightweight. The shelter they provide allows you to stay out in the sun for longer periods of time. When shopping for an ideal sun shelter to take to the beach, there are a lot of important details to keep in mind because they come in different shapes, sizes, designs and materials. Not to mention their set-up and take down methods and their resistance to sand, wind and showers. Of course the all-important sun protection they provide should also be looked into. The sun shelter you take with you to beach has a big effect on whether you will be enjoying the beach or feel sorry you opted on the type of sun shelter you have. Given the numerous details you need to look into, shopping for a sun shelter can be a tedious experience. However, if you go to looking armed with the right knowledge, shopping for a sun shelter will be an enjoyable experience! How many people the sun shelter/tent comfortably accommodate? How heavy / light is it? How does its assembly and pack up procedures look like? 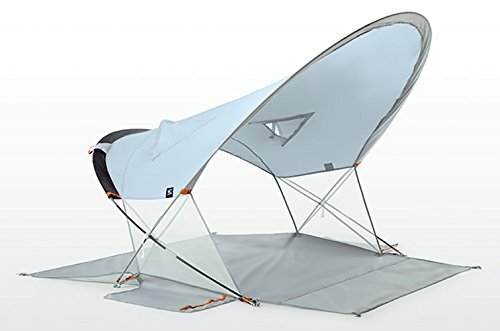 How does the sun shelter / tent support mechanisms look like? Does it have doors for privacy? Does it have windows for ventilation? Does it have interior storage pockets for your personal stuff? Does it have sun protection features? Of course, the all-important question is: Are you shopping for just a sun shade, a full tent or one that has both features? Design – Based on what you really need, choose between tents with 3 walls, a door and mesh windows on its side walls or a tent with just a roof and open sides. There are tents too that have 3 walls and minus a door. Size – Sun shades / tents come in a variety of sizes – There are those that can accommodate 1 person to as much as 5 to 8 persons. Keep in mind that larger tents are heavier. Ease of Set-up and Take Down – Minimal time and effort to set up and take down the tent is important. You would not like to stress yourself with these things. The set must come complete with all the parts needed to put it up. Detailed instructions should also be included. It is important though that you practice the set-up and take down at home before taking the tent to the beach. Materials – The durability and function of the tent is extremely important. You would not like to own a tent that will easily tear apart. Polyester is the most popular and durable material for tents. Choose one that is waterproof and flame retardant. More importantly choose one that has a UV protection. A UPF 50+ would be the best. Look closely into the poles, frames and stakes that go with the tent. You would not like a tent that would collapse with the slightest blow of the wind. Warranty – Any product that comes with a manufacturer’s warranty is most likely to be one with a good quality. A lifetime warranty would be great although this is something difficult to find with tents. Go for one that offers the easiest replacement and or refund procedures for defects within the warranty period. If you exactly know what you need and what you are looking for in a tent, finding the right one will be a piece of cake. A beach sun shade is no different than one you would take to the park or for an outdoor event. A beach tent is also no different than one you would take to a camping trip. While a camping tent needs to have secure doors, a beach tent can do without one especially when its main purpose is to provide shelter from the sun. Depending on your needs you can choose between both designs. Of course a full tent would cost more than an open sun shade. The most important thing in choosing a sun shade / tent for the beach is to determine its intended use. Unless you would opt to have one that is multi-purpose or versatile. This of course would cost more but if you are willing to shell out extra dollars, this could be the best choice for you or maybe not, too. Again, it depends on what you really need. A beach sun shade/tent is not intended for one-time use. It is something that you would want to enjoy for multiple trips to the beach. Regardless of design, it is highly recommended that you choose one that comes with the most durable material your budget can afford. The same goes for the frame, poles and stakes. The sun shade/tent you take with you to the beach will make or break your trip. It is as important as the swimwear, food and beverage coolers you take along. A trip to the beach is supposed to be a relaxing and enjoyable experience. Do not ruin it by taking with you the wrong beach sun shade / tent. You need to be extra careful in your choice when you are taking along kids, especially babies. Choose the right one and half of your beach experience has already been a success the moment you get hold of your beach sun shade/ tent. You have a lot of options at the tip of your fingers. So, after reading this post, it should be easier for you to make a perfect decision about buying the perfect beach tent based on your own budget and requirements.